Twitter is a torrent of information. And those tweets just go whizzing by on your timeline! So with all the noise on Twitter, how do you find the information or people you are looking for? Well luckily for us, Twitter has provided a simple tool and some powerful tricks to help you find the exact things you are looking for. 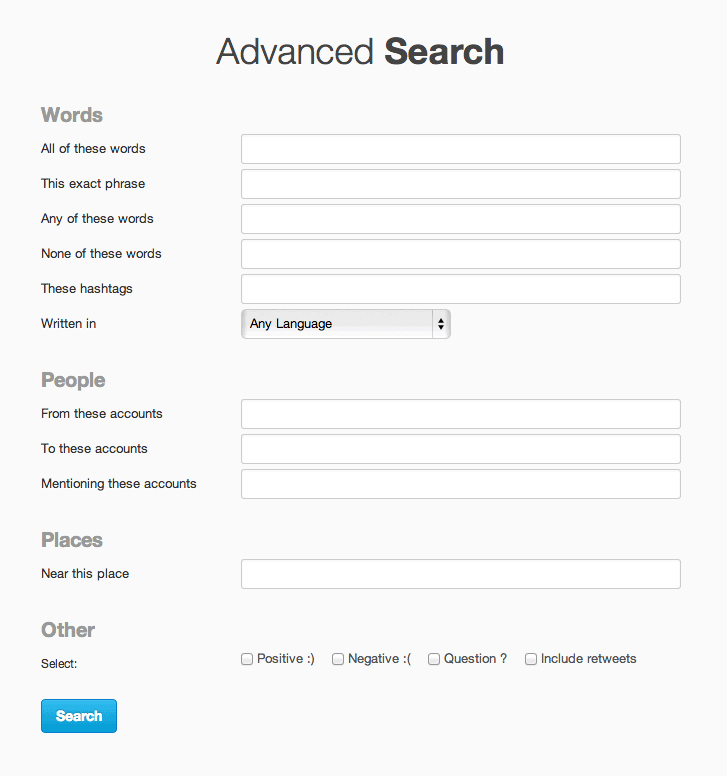 Let’s take a detailed look at Twitter Advanced Search and how it can help you. Doing searches using the advanced search interface provided by Twitter is actually pretty easy. You have four sections which you can fill out and help you find the tweets you are looking for. I will break it down for you and provide some examples to help you understand how it works. The first is the Words section, which gives you lots of options for narrowing down your search. If you wanted to find all the tweets containing blogging and fitness but not involving pilates. If you wanted to find all the tweets on blogging OR writing and including the topic weight loss. If you wanted to find all the tweets on blogging and fitness but not only in French. If you wanted to find all the tweets on blogging and social media during the South by South West Festival in 2013 (#SXSW13). All you need to do is type in a twitter handle or handles (eg. madlemmingz, justinbieber) into the field that does what you need. 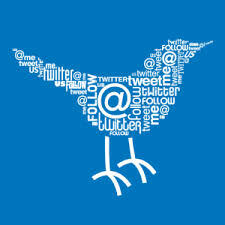 Because tweets are sent from a specific location, Twitter can help you narrow your tweets down to an area. Simply type in where you want your tweets to come from. For example, if you are a physical business in Seattle, you might want customers near you – just type in Seattle and fill out any other relevant fields you need to find the tweets. **Note: If you need a more accurate location, you can use Geocodes. There is more detail on this further down in this post – click this link if you want to jump to that. This section seems a little crazy, but it is actually quite helpful. The attitude fields (positive, negative) help you find tweets where people are happy (or not). So you can use it to find people with problems your business can solve. For example, if you want to find people struggling to lose weight, just check the Negativeattitude field, and then type in weight lose in the All of these words field. Similarly, you can find people who are asking questions, or only find retweets. All by checking the appropriate field. The Twitter Advanced Search Interface is great, but sometimes you want a more detailed query. That is where the following section comes in handy. It shows you how you can do the same queries as above and more. And another benefit is, you can do it easily from the main Twitter page by just typing into the search field at the top. The table below shows you the type of search, how you would do it, and the types of results you will get. The above list of search possibilities might seem a little confusing, so I thought I would explain a few of the less obvious ones. Twitter has found a way of determining if tweets are positive or negative, and by using these symbols in your search you can find these kinds of tweets. One great example of this is if you as a marketer are trying to find people with a specific problem which you can help them solve, and perhaps lure them to your website. Let’s say you are selling a guide on how to lose weight fast: why not search for people who are having trouble losing weight? If you run a business with an actual store in the center of Seattle, then you are probably wanting to connect with or find customers nearby. This is where Twitter location search comes in handy. If you are selling nutrition supplements for adding muscle fast, you could search for people near you tweeting about this. Location search can be a bit hit and miss with Twitter, so using Geocodes is your best bet. I know, it sounds confusing, but just popover to this site and type in your address to get your Geocode. And you can head over to this post on Twitter location search to see how to do it on TweetDeck, Hootsuite etc. This is a great way to find people who you might want to interact with. For example, I stumbled across someone the other day (not actually using search, but by chance) who was asking if anyone knew how to migrate from blogger to wordpress? If you offered this service, it could be something you are looking for with a search like:blogger wordpress migration ? Filtering is one of the things you can only do with this type of search. There is alot of power in Twitter search, and it can really help you find people who need your help or services. Combine the right kinds of words and filters, and you will be finding the people or tweets you need in no time. Try out the Twitter Advanced Search Interface to begin with, but if you want more power and freedom, learn the special words and just type them into the search bar as you use Twitter.